All Hell is breaking loose in California as residents are being burned out of their homes, neighborhoods and businesses, while Gov. 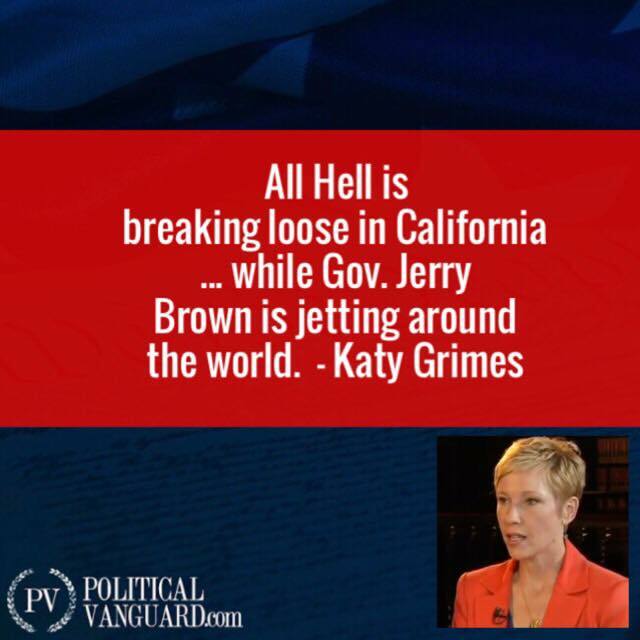 Jerry Brown is jetting around the world spouting climate change propaganda. He calls this California’s ‘new normal.’ “With climate change, some scientists are saying Southern California is literally burning up, and burning up as maybe a metaphor or a description not just to the fires right here, but what we can expect over the next years and decades,” Brown said. I say ‘propaganda’ because Brown loves to cloak himself in false religiosity (ironic as a seminary drop-out) for the purpose of manipulation. And obfuscation. And diversion. While speaking at a summit of mayors at the Vatican in 2015, Brown pontificated that the world may have “gone over the edge” on global warming. “We’re talking about extinction,” Brown said. I’m assuming Brown and his entourage didn’t fly to Rome, or Paris, or Brussels, or China on solar powered planes. Intimidate/Blame. Accuse/Project. Argue/Exhaust. Deny/Rewrite. Divert/Attack. Fear/Avoid. 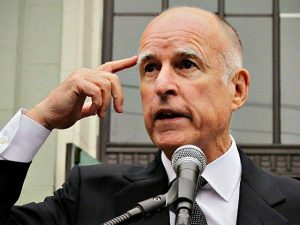 Jerry Brown: Preacher, Scientist, or Dingbat? In his January 2017 State of the State address, Brown dug in his heels and pledged to continue forging dubious climate agreements with other states and countries. He made it very clear he would be at odds with the Trump administration, and the President. “With a newfound role as Trump counterpoint on the world stage, the 79-year-old California governor doesn’t have much time to worry about how his public service will be remembered,” Vanity Fair opined. In November, Brown lectured scientists on climate change at a European Union meeting in Brussels, and proselytized that California will be ‘wiped out’ by climate change. The economically strapped middle class continues to flee California because of bad schools, very high and increasing taxes, rampant crime, and declining local and state services. California is home to one-third of the nation’s welfare recipients. California is home to the most residents living below the poverty line in the country. And now with our politicians’ disregard for federal immigration laws, more than a quarter of the 38 million Californians were not even born in the United States. “The narcissist projects the things they are answerable for onto the other person.” Once the Golden State of opportunity, California has become the welfare state of nanny government, entitlements, and oppression, and far fewer individual rights. “Narcissists have the ability to take a person’s small fear and turn it into paranoia. Their charisma is put to destructive uses as they weave a believable story with an intense dreadful outcome”: Climate Change. Katy Grimes hits all the main points very eloquently as she always does! Here is the nuts & bolts of this we are mismanaging our forests not allowed to cut fire breaks , remove dead trees & do controlled burns etc , The CAL FIRE Chief explains some of the minimal things they have tried to do , but Brown the Clown & his ecofreak band of warriors still will not allow 90% of what needs to be done in our forest & mountain areas !! !